If I look back at my instagram and pinterest ‘likes’ so many of the pictures I’ve clicked like on a are rainbow colours. I guess my psyche is trying to tell me that I’m a Spring/Summer person, rather than an Autumn/Winter kind of girl! Spring this year has been somewhat slow to arrive, it really is time for some sunshine and perhaps some temperatures about ten degrees! I really love an applique t-shirt for children, much nicer than the character ones (that they love so much!). 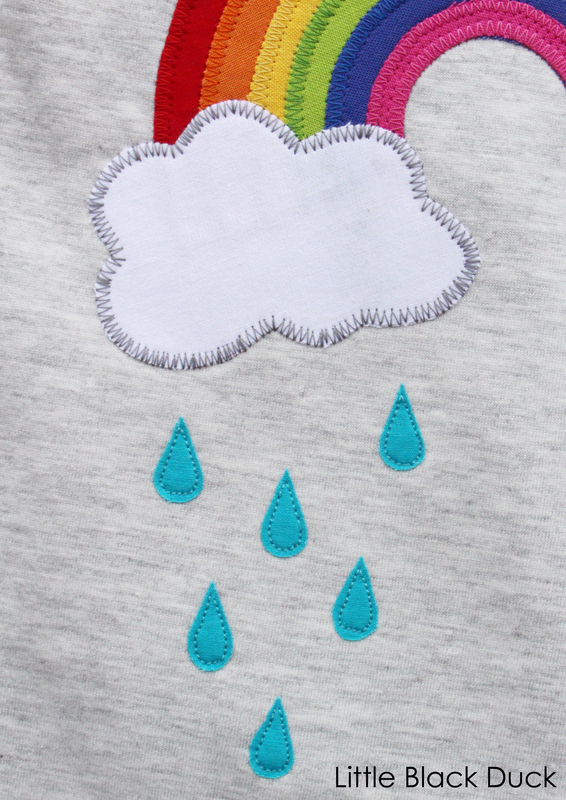 So, I thought it would be fun to design an applique project along the rainbow theme. Below you will find step by step instructions and a link to download the applique pattern pieces. Find yourself a plain t-shirt, some scraps of bright fabrics and you are away! 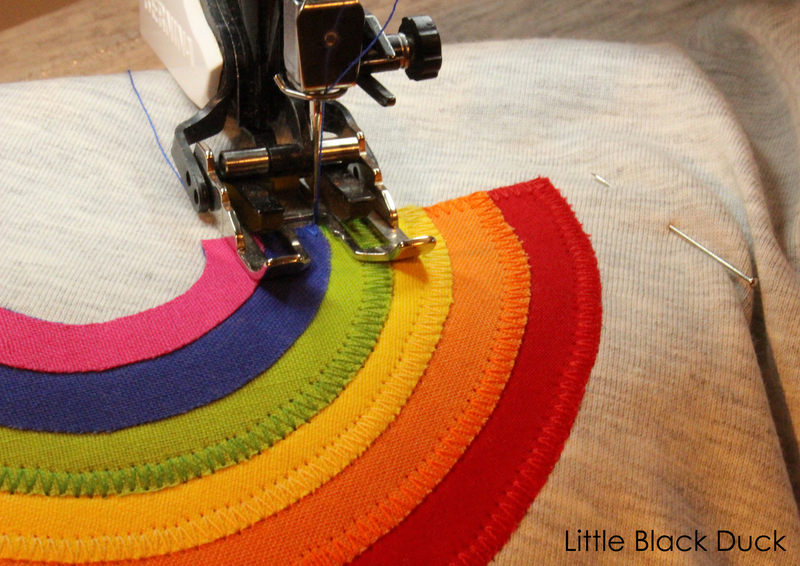 Download your FREE Rainbow Applique Pattern Pieces. Trace all pattern pieces onto the paper side of the Bondaweb (remembering to reverse the cloud shape) and roughly cut out (about 1/4” from the pattern line). Iron Bondaweb shapes onto the wrong side of your fabrics and cut out precisely/along the pattern line. Arrange all of the pieces on your t-shirt. Layer the Rainbow Stripes on top of each other, starting with the red/largest first. Iron in place the Rainbow and the Sun, putting to one side the Cloud and Raindrops for the time being. Attach stabiliser on the inside of the t-shirt. When you are stitching make sure that you don’t sew through both layers of the t-shirt! 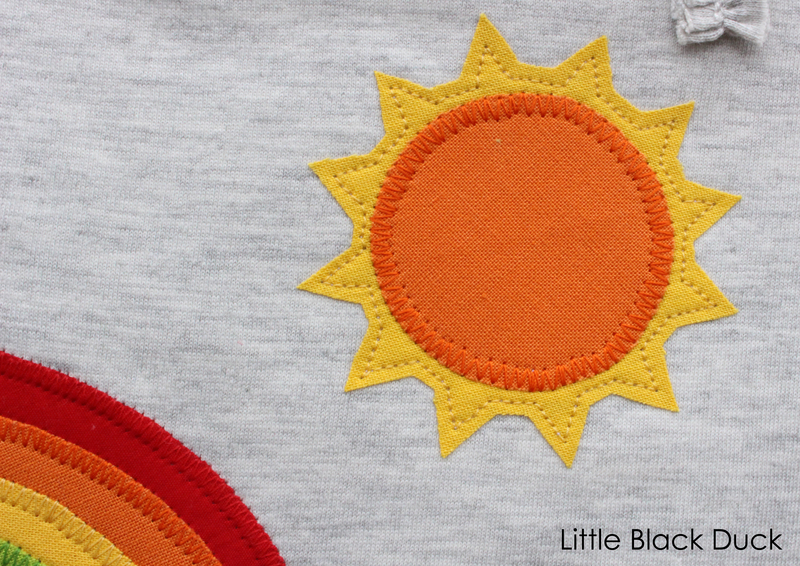 Sew around the Centre of the Sun with a zig-zag stitch. Stitch around the Sun’s Rays with a straight stitch close to the outer edges. See pic below. Sew around the edges of the Rainbow stripes with a zig-zag stitch, changing thread colour for each stripe. This may seem like a pain, but it will be worth it! Consider using a mid grey thread in your bobbin, rather than changing it each time. Just test your stitching on a scrap of fabric first to see if you need to adjust your tension as you wouldn’t want the bobbin thread showing on the right side. See pic below. Position the Cloud over the bottom of the Rainbow and the Raindrops under the cloud. Iron in place. Sew Cloud in place with a zig-zag stitch. I’ve used a grey thread so that it gives a bit more definition to the cloud edges. Sew the Raindrops in place with a straight stitch close to the outer edges. See picture below. Pull all threads through to the inside of the t-shirt, tie off and cut away excess thread. Remove excess stabiliser from the inside of the t-shirt. How about sewing some or all of the design onto a bag or onto a cushion? 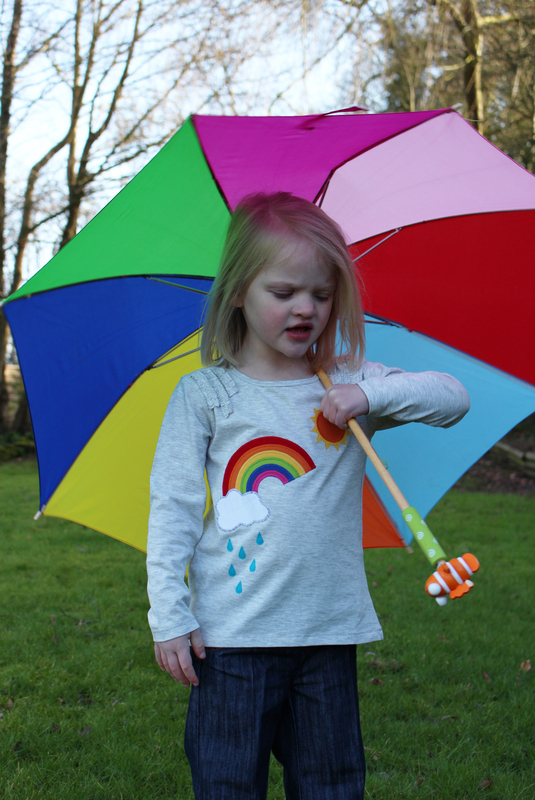 You could scale up the size of the rainbow and use just that part of the design on a t-shirt – super cute! Alternatively, try enlarging the cloud a little and cut out lots and lots of raindrops. I have started a facebook group: Little Black Duck :: In The Sewing Room where you can share pictures of your makes and ask for advice. Come and join in, it will be great to hear from you!